What a massive night Saturday is for Irish sport, and with a large 'World Cup shadow' over events in both Dublin and Copenhagen. For what my opinion on soccer is worth, Norn Iron definitely 'wuz robbed' last night and I wish them all the best in the second leg, as I do to Martin O'Neill's men in their first. But of course that's not the only World Cup involved this weekend...having been supposedly favourites to host RWC2023, Ireland now goes head to head with the nation that leapt like a....hmmm, the appropriate leaping animal analogy escapes me...well anyway, they leapt into pole position. As for Joe Schmidt, I reckon it's the 2019 edition of the tournament that is most occupying his thoughts these days, and his preparation windows are running out. Guinness Series 2017 and 2018, Six Nations 2018 and 2019, a 3-match series in Oz and I'm assuming a few warmup games. That might seem like a lot, but that opening date with the Scots on 22/09/19 will be on us before you know it. 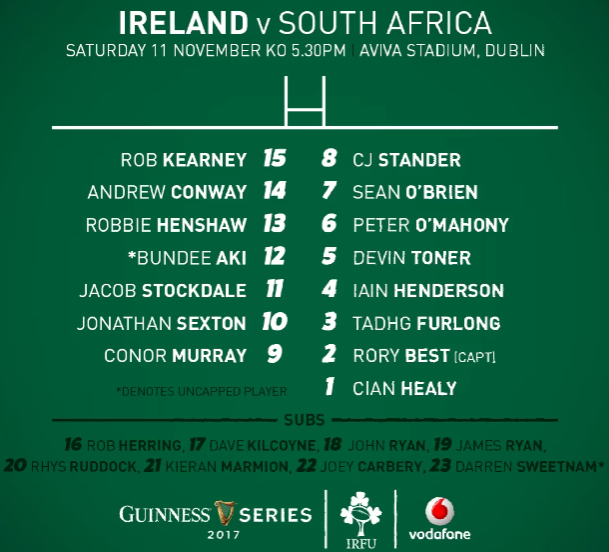 What seems to be the biggest focus [and rightly so] is increasing his pool of not only available players, but also reliable ones and this selection really looks like a mix between what we'd arguably call his 'untouchable XV' from 2015 and a host of worthy candidates given the chance to hold up their hands. Starting point has to be the centre, which of course brings me to Bundee Aki. I dealt with the ridiculous eligibility narrative last night in the hope that it wouldn't leak into today's preview, but we want a lot of things we don't get. Many question Aki's inclusion in this team - for me, it was obvious for many reasons. First and foremost we must take into account Joe's vision of the role of the Irish 12 and 13. Basically it's Jared Payne who ticks all the boxes for him at outside centre, and he is not available, nor is Garry Ringrose, his natural successor. And so to plan C - having watched Robbie's performances for Leinster [including the full beast mode v Montpellier] it makes sense to put him in the pivotal defensive role and let Aki do the 'crashing', thus reuniting Connacht's 2016 championship pairing in the process. There are other things in Aki's favour as well in that he has faced South Africans before and what's the other one? Oh yeah - he's a damn fine player who has shown great form at provincial level. Sure, he has issues to work on, like discipline perhaps, but so do others in the squad. Then we have an interesting back three, all from different provinces. As Joe was quick to point out at his press conference, Rob Kearney rarely lets him down in the green jersey and that's hard to argue. Plus he offers exactly the right amount of experience to counter the talented wingers either side of him. I was always keen to see Conway play for Ireland going back to his schooldays, and as for Jacob Stockdale, if he plays to his full potential on Saturday it will be tough to get that jersey back off of him. In the pack there is a much more settled look. Cian Healy has made the most of his appearances for Leinster this season and deserves a shot though I have to feel for Killer getting overlooked again - whatever his province, he's about as close to my favourite type of loose head prop [of which I was one way back in the day] as we have in the Irish game. And that back row - wowza. I mean, I know we have incredible stocks in that department these days anyway but just looking at those three names side by side can only give you confidence against the Boks who rely so heavily on physicality. And they all offer decent lineout options too - along with Henderson and Toner that should give us at very least our own setpiece put-ins though we know Etzebeth and co will have a thing or two to say about that. I wonder if it's a coincidence that the bookies have an Irish win by six points, as that was the margin in all three tests in 2016. Well I agree that we can win on the day, though I think it might be by a smidge more, seven to nine points. I always say this about Joe-led teams but once again we'll need to establish a lead early and make sure the visitors' attempts to knock us off our game are thwarted. PS - And congratulations to Ian McKinley - what a story! He has come a long way since August 31, 2011 when his initial retirement was made official. Hopefully we'll see him with Italy when they visit Dublin in the February 2018. Replacements: 16. Bongi Mbonambi 17. Steven Kitshoff 18. Wilco Louw 19. Franco Mostert 20. Uzair Cassiem 21. Rudy Paige 22. Handré Pollard 23. Francois Venter.